Subaru is a slightly shy and lonely 12 year old girl and the only member of her school’s astronomy club. On the day of an expected meteor shower, she grabs her prized telescope from home and rushes to the club room which doubles as an observatory. However when she opens the door, instead of finding the club room she discovers a very lush greenhouse. Inside she finds a boy around her age called Minato. She asks him what he is doing there but he mostly gives vague answers. Subaru feels like she is in a dream, however she still wants to see the meteor shower. As she leaves the greenhouse, a small blobby creature jumps on her and takes away her compass. She runs after the creature but eventually loses sight of it. Walking down the hallways of the school, she manages to unseal a door which was locked by magic. Inside are four girls in strange wizard or witch-like outfits, one of which is her old friend, Aoi, whom she hasn’t seen much of since she decided to attend another school. It turns out the small octopus creature which stole her compass is actually a Pleiadian, and alien from the Pleiades star cluster. The alien has asked the four girls to help him find parts of its spaceship’s engine which were scattered in an accident seven years ago. As the alien cannot speak Japanese, he uses one of the girls, Nanako, as a translator, possessing her to speak as such. The alien uses Subaru’s compass to create a drive shaft, a kind of magical broom that the girls ride. Much to Subaru’s surprise her school uniform also transforms into a similar wizard’s outfit, the same as the other girls. Despite Subaru’s protests and pleas for an explanation to what is going on, the girls ignore her as they all take off into the sky to capture a piece of the engine which has appeared. Through a bit of trial and error, the five girls manage to capture the piece of the engine, which has taken the shape of a kind of a large spiny crystal-like star. With their magic they reduce the engine piece to the size of a tennis ball and into something that looks like a piece of Konpeito candy. Thinking that their work is completed, the girls soon find themselves under attack from a young man in a black cape and with black horns. He attempts to steal the engine piece. However he fails, and somehow in the confusion it ends up under Subaru’s hat. To top off a rather eventful and confusing day, Subaru manages to see the meteor shower with the other girls while riding in the sky. The following day Suburu goes to school and discovers that the girls, Aoi, Nanako, Itsuki and Hikaru are in her class, which is odd because most of them don’t go to her school. None of the other students seem to notice what has happened. Aoi and Subaru also note that their pasts contradict each other’s recollections. The alien believes that his spaceship has caused this. Somehow it is pulling together alternate timelines. The creature latter explains that if his ship appears, it will causes massive problems on Earth. He needs the girls to find all the parts of his engine in order to keep it hidden in another dimension permanently. Luckily only the five girls can see the engine parts and the Pleiadian. But to cover themselves and to have a base for their activities (i.e. a clubroom), they form a Cosplay Research Club. In the meantime they teach Subaru how to ride a drive shaft broom. Suburu also tries to patch up her friendship with Aoi which ended on a sour note when they went to separate high schools. She consults Minato whose greenhouse seems to appear randomly in different areas of the school. He explains that he went through a similar situation previously. To find the engine parts, the Pleiadian performs a "meteor shower forecast". In this forecast he discovers that two engine parts are nearby. The girls do manage to capture both, but yet again the boy in the black cape appears and this time steals one of the engine parts from them. This show has some strange origins. It’s actually a collaboration between car manufacturer Subaru and Gainax. Originally a series of five minute shorts steamed on Youtube in 2011, a movie version was later announced in 2013, only for it to be never mentioned again. I’m assuming the movie was formatted into this 12 part TV series. It does seem really weird that a car maker would fund a magical girl anime. The astronomical imagery and themes are easier to understand as Subaru in Japanese is the name of the Pleiades star cluster (which bizarrely a Japanese language teacher told me wasn’t correct, but he was a dickhead anyway). Subaru’s logo on their badges is actually the Pleiades star system. Naturally there are a bunch of a Subaru and car references in the show; the drive shaft brooms which have car headlights on the front of them and later grills of specific Subaru models, and the fact the brooms make the sounds various Subaru engines. Then of course we have the lead character called Subaru. However none of the car references are all that distracting or really obvious. There’s no shots of any Subaru cars and none of the characters are named after Subaru models. 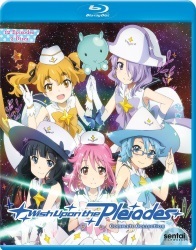 For the most part, “Wish Upon the Pleiades” is nothing really ground breaking in terms of magical girl anime. The five girls have their own distinctive personalities which are for the most part common archetypes found in modern day anime series. You have Aoi who is a bespectacled girl who fussed a bit too much over the clumsy yet lovable Subaru. Itsuki who is essentially a clone of Tomoyo from “Cardcaptor Sakura” with a few other girls mixed in for good measure. Then you have Hikaru who is probably the most energetic and boisterous of the lot. Finally you have Nanako who has an interest in the occult, is always seen wearing a witches hat and cape and is a conduit for communicating with the Pleiadian. The connection between the black caped boy who steals the engine parts from the girls and Minato should be utterly obvious to anyone who has seen any magical girl anime from the last 25 years. As the series progresses, the girls collect the engine parts, which each successive part being found further and further way from the school. It doesn’t take too many episodes in before they venture out into deep space and eventually out to deep space and even outside the universe. Gainax have done a fantastic job in presenting the solar system and the universe in a realistic fashion, even though the magical genre is usually involves fantastical and unrealistic elements. Later episodes involve near light speed travel and other astronomical concepts. There’s even nerdy references to the NASA/Jet Propulsion Laboratory’s Voyager and Pioneer spacecraft. Naturally the series also has at least one episode devoted to one of the cast members where they have some sort of deep seated issue which is solved by the end of that episode. Most also explore their backstories where it is revealed all of them witnessed the separation of the engine parts some seven years ago. The other element of the story which makes it unusual is the concept of alternate timelines. Though it’s not really explained in detail, somehow the alien’s spaceship can draw alternate timelines together or take people back within timelines to take a different path. Though the series does get a bit serious and melodramatic in the last few episodes, there is a lot of humour to be found in the show. Most of the time it’s pretty light hearted and doesn’t take it’s self too seriously. For the most part it’s a really fun and colourful show and goes against a current trend in magical anime where everything thing seems to so pitch black and serious, where the main cast either die or horrible things happen to them. I know sort of stuff has been a part of magical girl anime since “Sailor Moon”, but lately that stuff has been a bit too nihilistic for me. Despite the lawsuits, the defections to Studio Khara and Trigger and other troubles the studio’s had, this show proves that Gainax is still able to make great anime. The show was directed by Shoji Saeki whose only other real directing credit is Gainax’s last real hit, “Medaka Box”. Overall this is a fun and light-hearted series for the most part and I enjoyed it immensely. A lot of the plot isn’t all that original, however there’s a lot of interesting elements to keep you intrigued, the designs are nice, the animation is pretty darn good and the characters more than won me over (even though they’re largely archetypes). I’ll give this show a solid 7.5 out of 10. Remaining Backlog: Five TV series and one movie. In addition I am also waiting for the second part of one TV series to be released before viewing it.